Pressure Systems International, an automatic tire inflation systems provider, has invested in a new aerodynamic technology and entered into an exclusive distribution agreement with Plasma Stream Technologies. 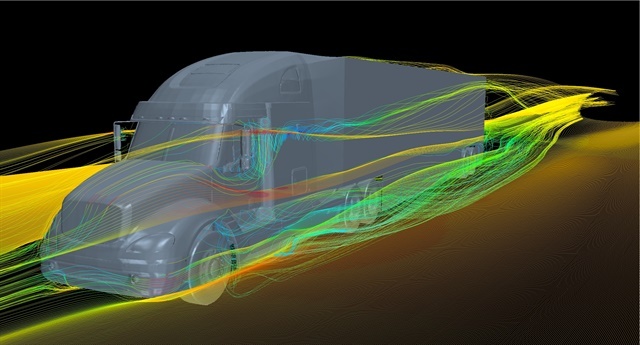 Plasma Stream’s plasma actuator technology is designed to reduce aerodynamic drag on trucks and trailers by manipulating airflow around the vehicle. The active flow control system offers aerodynamic benefits without the added weight and maintenance issues associated with bolt-on aero devices, according to the company. The system is deployed automatically and has the flexibility to be used with roll-up doors as well as swing doors. Plasma Stream’s technology uses an active flow control system using plasma actuators and was developed by the University of Notre Dame. The system is capable of generating a body force, which controls flow separation from the vehicle. This reduces the drag force on a vehicle and allows a vehicle to be streamlined without changing its actual shape. Plasma actuators ionize the local airflow to induce a similar effect to physical devices such as spoilers, flow plates and boattails but do not require added structural components or weight. “We expect P.S.I.’s reputation, knowledge of the market, and well-established distribution channels will spur market adoption and give us the capability to bring Plasma Stream’s technology to trucking fleets worldwide,” said Corey Park, director at Plasma Stream. Read more about Partnership Investment Aerodynamics P.S.I.